Profiling the “Axe-Gods” – James A. Doyle, Ph.D. In class, while discussing Olmec art, we took a look at the “Kunz” jadeite axe in the collection of the American Museum of Natural History. This class of items, although few are known from stratigraphic excavation, were likely funerary offerings, such as the one recovered in Tomb E at the site of La Venta. The principal features include the prominent head proportionally larger than the rest of the body, downturned mouth often with feline dentition, hands grasping or held parallel, and sometimes Olmec “flame eyebrows” (see Taube 1996). One of my students, new to the field of Pre-Columbian art, asked an excellent question: why are these objects known as axes or celts? I then brought up the images of one of the great Olmec pieces in the collection at the Cleveland Museum of Art, for which they provide profile views. Whereas we are accustomed to focusing on the frontal view of these figures, the profile view enhances the sense of sharpness or “axe-iness” of these three-dimensional sculptures. On the Olmec examples, most have a visible groove where, presumably, the stone could have been hafted to a shaft. As many have noted, (e.g., Snarskis 2003:163-168; see also Easby 1981; Graham 1995, 1998), the practice of incising or modeling figures out of stone celts also became a widespread practice in ancient Costa Rica. In fact, many of these objects have complex biographies, found in Costa Rica after having been incised and worn by other Mesoamerican peoples. However, it is unclear whether or not the numerous Costa Rican examples were former celts worked into pendant figures, or whether they were influenced by the movement of peoples and ideas from the Olmec tradition (e.g., Graham 1992:173, 189; Pohorilenko 1981; Salgado González and Guerrero Miranda 2005; Snarskis 1998:63; *Update, Hoopes has brought to my attention an in-press work by David Mora Marín that further examines relationships between pendants in Costa Rica and Mesoamerica, see Mora Marín n.d.). The greenstone pendant tradition may extend beyond the Isthmo-Columbian area to the circum-Caribbean as well (see Rodríguez Ramos 2011:Fig. 1h). Perhaps the profiles can reveal new clues. Two obvious types of pendants emerge when examining the collection: those with avian and anthropomorphic features. Several “axe-god” pendants with avian imagery, including beaks, cleft crests and sometimes tail feathers, and incised wings or feathers, exist in the Dumbarton Oaks collection, such as PC.B.225, PC.B.229, PC.B.230, PC.B.231, PC.B.239, and PC.B.293. As with the Olmec carved axes, the “axe-gods” often have a hafting groove, whether real or only indexing axe-iness. 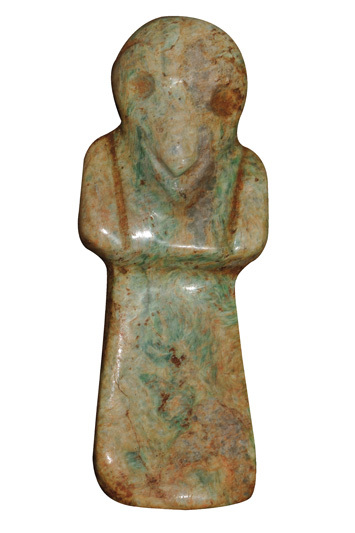 Although with these jadeite objects, the perspective of the imagery is shifted vertically so that the “heads” of the bird figures are at the narrow end, rather than at the wider face as with the Olmec celts (Graham 1995:20-21). Furthermore, Costa Rican jades are almost universally perforated to be worn, while Olmec celts were not (Easby 1981:138). Few are known from archaeological contexts (see Garber et al. 1993:219-226; Guerrero M. 1998: Pl. 11, Fig. 11; Snarskis 1977: Fig. 7). Below are two of the best examples to date from modern-day Costa Rica. (l) Pendant, Talamanca de Tibás, Guerrero M. 1998: Pl. 11; (r) Pendant, La Regla, Guerrero M. 1998: Fig. 11. These Costa Rican objects also recall the recently discovered pendant in a tomb at Takalik Abaj, Guatemala (see also Easby 1963). In his recent address at the Symposium “Revealing Ancestral Central America” at the National Museum of the American Indian, John Hoopes remarked that the Takalik Abaj pendant perhaps originated in Costa Rica rather than the highlands or Pacific Coast of Guatemala (see Mora Marín n.d.). Other “axe-gods” are not overtly avian at first glance from the front, especially some of the smaller-scale pendants such as PC.B.228, PC.B.233, PC.B.234, or PC.B.238, until one examines the objects from the side. Subtle incisions or deep carving evoke feathers, crests, and beaks of tropical birds. The representation of the tail feathers in the lower part could hold clues when considering the particular species represented, if there were a taxonomic association in the first place. The likelihood is high that the peoples of ancient Central America and Colombia had a fluid concept of species, remote from our own Linnaean taxonomy. The long, sharp tails of the example Dumbarton Oaks pieces could represent parrots, such as macaws, sought after for colorful feathers used in personal adornment. Other prominent candidates are important large birds in the area, including King Vultures or Harpy Eagles, both with distinctive features (see Graham 1992:194-195; Dumbarton Oaks past exhibit “Flights of Fancy: Birds in Pre-Columbian Art“). So the avian pendants such as the ones above might not be proper targets for the “quaint” (Easby 1981:139) descriptor “axe-god” upon further study. It seems that the reexamination of ancient Central American spirituality and “life on the ground,” such as that discussed by Rosemary Joyce in her address at the NMAI Symposium, calls for a new look at these symbolic systems (see Fernández 2013). The lack of explicit “supernatural” or “godlike” features on most of these pendants may lend credence to alternative interpretations, such as ancestral or hunting talismans. So, perhaps it’s time to axe the term “axe-god”? Maybe it’s for the birds. Berrin, Kathleen, and Virginia M. Fields, eds. 2010. Olmec: Colossal Masterworks of Ancient Mexico. New Haven, Yale University Press. 1968. Pre-Columbian Jade from Costa Rica. New York, Andre Emmerich, Inc.
1981. Jade. In Between Continents/Between Seas: Precolumbian Art of Costa Rica. New York, Harry N. Abrams, Inc.
Fernández, Patricia. 2013. Between Beliefs and Rituals: Material Cultures of Ancestral Costa Rica. In Revealing Ancestral Central America, Rosemary Joyce, ed., pp. 59-67. Washington, Smithsonian Institution. Garber, James F., David C. Grove, Kenneth G. Hirth, and John W. Hoopes. 1993. Jade Use in Portions of Mexico and Central America: Olmec, Maya, Costa Rica, and Honduras – A Summary. In Precolumbian Jade: New Geological and Cultural Interpretations, Frederick Lange, ed., pp. 211-231. Salt Lake City, University of Utah Press. Graham, Mark Miller. 1992. The Early Art of the Atlantic Watershed of Costa Rica. In Wealth and Hierarchy in the Intermediate Area, Frederick W. Lange, ed., pp. 165-206. Washington, Dumbarton Oaks. 1995. Iconography and Jade in Costa Rica. Vinculos 21(1-2): 17-28. 1998. Mesoamerican Jade and Costa Rica. In Jade in Ancient Costa Rica, Julie Julie Jones, ed., pp. 39-57. New York, Metropolitan Museum of Art. Guerrero M., Juan Vicente. 1998. The Archaeological Context of Jade in Costa Rica. In Jade in Ancient Costa Rica, Julie Julie Jones, ed., pp. 23-37. New York, Metropolitan Museum of Art. Lothrop, Samuel K. 1955. Jade and String Sawing in Northeastern Costa Rica. American Antiquity 21(1): 43-51. Mora Marín, David F. n.d. The “Charlie Chaplin” Silhouette Figural Theme: A Pan-Middle American Theme. Unpublished manuscript. Pohorilenko, Anatole. 1981. The Olmec Style and Costa Rican Archaeology. In The Olmec & Their Neighbors: Essays in Memory of Matthew W. Stirling, Elizabeth P. Benson, ed., pp. 309-327. Washington, Dumbarton Oaks. Rodríguez Ramos, Reniel. 2011. The Circulation of Jadeite Across the Caribbeanscape. In Communities in Contact: Essays in Archaeology, ethnohistory and ethnography of the Amerindian circum-Caribbean, Corinne L. Hofman and Anne van Duijvenbode, eds., pp. 117-136. Leiden, Sidestone Press. Salgado González, Silvia, and Juan V. Guerrero Miranda. 2005. La distribución de la jadeíta en Centroamérica y su significado social. Cuadernos de Antropología 15: 53-64. Snarskis, Michael J. 1979. El jade de Talamanca de Tibás. Vínculos 5: 89-107. 1998. 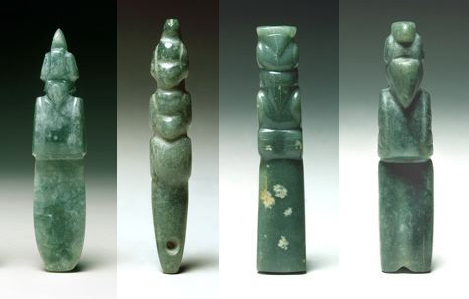 The Imagery and Symbolism of Precolumbian Jade in Costa Rica. In Jade in Ancient Costa Rica, Julie Jones, ed., pp.59-92. New York, Metropolitan Museum of Art. 2003. From Jade to Gold in Costa Rica: How, Why, and When. In Gold and Power in Ancient Costa Rica, Panama, and Colombia, Jeffrey Quilter and John Hoopes, eds., pp. 159-204. Washington, Dumbarton Oaks. Stone, Doris Z. 1973. El dios-hacha de jadeíta en la América Central: Su localización geográfica en el tiempo. Atti del XL Congresso Internazionales degli Americanisti, Rome-Genoa 1: 213-218. Taube, Karl A. 1996. The Rainmakers: The Olmec and their Contribution to Mesoamerican Belief and Ritual. In The Olmec World: Ritual and Rulership, pp. 82-103. Princeton, The Art Museum. Probably want to check the axe gods of the Mezcala culture in the state of Guerrero Mexico.